We’d love your help. Let us know what’s wrong with this preview of Awake at 3 a.m. by Suzannah Neufeld MFT. To ask other readers questions about Awake at 3 a.m., please sign up. Be the first to ask a question about Awake at 3 a.m. I enjoyed this book for the sake of the sense of solidarity it presents with mothers during the postpartum period -- especially those of us who have experienced depression and/or anxiety in that time. It is nice to read about someone else who's been through it and can zero in on some of the specific struggles and mental ruts we can get stuck in. 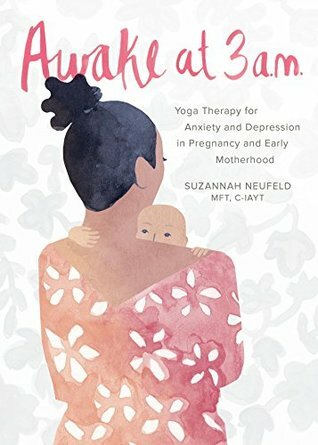 While I had a harder time connecting with the yoga aspects (and would question the philosophies behind some of it), it was still a decent introduction t I enjoyed this book for the sake of the sense of solidarity it presents with mothers during the postpartum period -- especially those of us who have experienced depression and/or anxiety in that time. It is nice to read about someone else who's been through it and can zero in on some of the specific struggles and mental ruts we can get stuck in. While I had a harder time connecting with the yoga aspects (and would question the philosophies behind some of it), it was still a decent introduction to some poses and calming techniques that could be very valuable. For those who are already into yoga especially, this is a great resource for the postpartum period, and even for those who haven't been diagnosed with depression or anxiety, there is some good practical wisdom here for moms in general, involving topics such as comparisons, perspectives, expectations, etc. I suffered with postpartum depression, anxiety, and OCD after the birth of my son; I'm also a certified birth doula. This book is now one of my go-to resources for friends and clients who are struggling with maternal mental health issues. It's a wonderful idea, easy to put into practice, and requires very little extra effort for a large return. I only wish this had been available when I was fighting my perinatal mood disorders. Highly recommended. *I received an ARC from the publisher via NetGall I suffered with postpartum depression, anxiety, and OCD after the birth of my son; I'm also a certified birth doula. This book is now one of my go-to resources for friends and clients who are struggling with maternal mental health issues. It's a wonderful idea, easy to put into practice, and requires very little extra effort for a large return. I only wish this had been available when I was fighting my perinatal mood disorders. Highly recommended. A lovely book that would definitely reassure a new mother. I am not one of those so I didn't read the whole thing but I felt like I would share this with friends of mine who need some support and advice. It's almost like a hug in a book!